Last season, the Big Three got their championship, a year later than many expected. Then, they got a Big Four adding aging star Ray Allen who looks like he still has something in the tank. We all know that LeBron and D-Wade will dominate, and so will Chris Bosh if healthy. But, will the role players and key reserves be enough to lead the Heat to their second straight championship? Well, probably. The Bulls were well on their way to the Eastern Conference Finals until Derrick Rose went down. It is yet to be known if he'll be ready for the start of the season but the Bulls should be very cautious about him. If he isn't ready expect rookie Marquis Teague to start or tiny Nate Robinson. D-Rose should be joined by a strong supporting cast including still effective Carlos Boozer and Luol Deng along with electric Joakim Noah. It should be enough to get to the Eastern Conference Finals, if not further. The last few years we have been repeating it. The window is closing for the Celtics. This year looks like it will be the last year of contention for a while in Boston. Kevin Garnett returns and still has some points to score. Paul Pierce could dominate and their is no question that Rajon Rondo will be an All-Star this year. Depth is no issue for Boston as they have Jeff Green and fantastic rookies in Jared Sullinger and Kris Joseph. The Sixers backcourt has finally grown up which means bad things for the rest of the Eastern Conference. 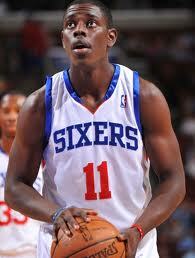 Jrue Holiday can score anywhere and Evan Turner has matured enough to be a star at this level. Jason Richardson gives playoff experience. Down low, new center Andrew Bynum is dominant when healthy and Spencer Hawes has his flashes. No team could take a bigger step towards the top then the Pacers who bring back a tons of effective options on offense in David West, George Hill and Tyler Hansbrough. Roy Hibbert was brought back and gives a dominant low post presence. The Pacers have fantastic forwards in Paul George who is the future of the franchise and do-everything Danny Granger. The new look Nets look like they have the best backcourt in the East with Deron Williams who should be dangerous with more talent around him and Joe Johnson who is still an All-Star type player at times. Gerald Wallace is a contributor and the Nets possess some low post options in Brook Lopez, Kris Humphries and Andray Blatche. No more Linsanity in New York which could end up being better as it gives the Knicks more stability. Carmelo will get his shots, Amare will dominate down low and Jason Kidd will run the offense in possibly his last year in the NBA. Those three should give the core of a championship contender, while Iman Shumpert and Raymond Felton should continue to improve. The second best backcourt in the Eastern Conference? Maybe the Bucks who have Brandon Jennings who looks to be less inconsistent and lethal Monta Ellis. Rookie Doron Lamb gives the Bucks a fantastic shooting threat. The frontcourt is young but good enough to help the Bucks sneak into the final playoff spot.